Until the arrival of the Teutonic Knights, the Prussian region of Chełmno (or Chelmo in English, missing the accented letter, plus Culmerland or Kulmerland in German) was a disputed part of the Polish region of Mazovia in western-central Prussia, a south-western tip of territory which was encircled by the River Vistula to the west and the Drewenz to the east. Battles here between the Poles and the Prussians were the initial reason for the knights of the Order being invited to settle in the Lower Vistula and provide a buffer for the Polish kingdom. Once the Order had conquered the Old Prussians, Culm became a diocese and an important stronghold. The Papal legate, William of Modena, oversaw the creation of the diocese in 1243, along with those of Ermland, Pomesania, and Samland, placing the seat at Kulmsee (Chelmza). This was moved in 1257 to Lubawa Castle. The bishop's seat is moved to Lubawa Castle. The Livonian Knights, along with the Teutonic Knights, are abandoned by their Estonian and Couronian vassals and severely defeated at the Battle of Durbe in Livonia by the Samogitians. As a result, numerous rebellions break out against the Teutonic Knights all across the Baltics, including a general uprising throughout Prussia known as the Great Prussian Uprising. The Prussians win several battles against the hard-pressed Knights, with Duke Skomantas of the Yotvingians attacking the stronghold of Chełmno in 1263, and by 1264 the situation is critical. Reinforcements arrive from Germany and the Order launches an attack against the rebels, with final defeat of the Prussians coming in 1274. Several uprisings occur in the thirteenth century, but none as serious as this. At the conclusion of the Thirteen Year War, along with the Teutonic Knights, the bishopric of Culm falls under the suzerainty of Poland. The Teutonic Knights' Ordenstaat is secularised and converted to Lutheran Protestantism as the duchy of East Prussia. In the same year, the reverberations of the Peasants' War in Germany reach Prussia. The bishopric of Culm survives the dissolution of two of the other bishoprics in Prussia between 1577-1587. In 1587, it gains the remaining Catholic areas of the former bishopric of Pomesania when that too is dissolved. The conclusion of the Second World War witnesses the expulsion of the German population by the Soviet Russian victors. 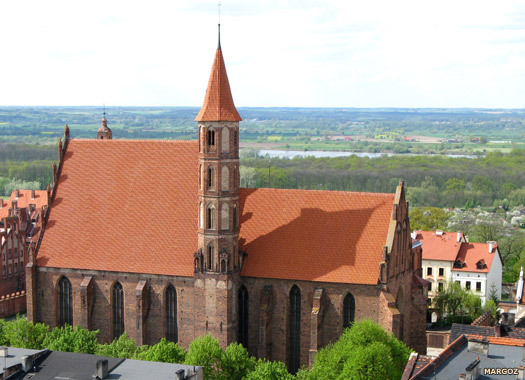 This expulsion includes the German bishop of Warmia, with the result that the position remains vacant in Poland until a new Polish diocese is formed in 1972. Culm itself becomes part of Poland.